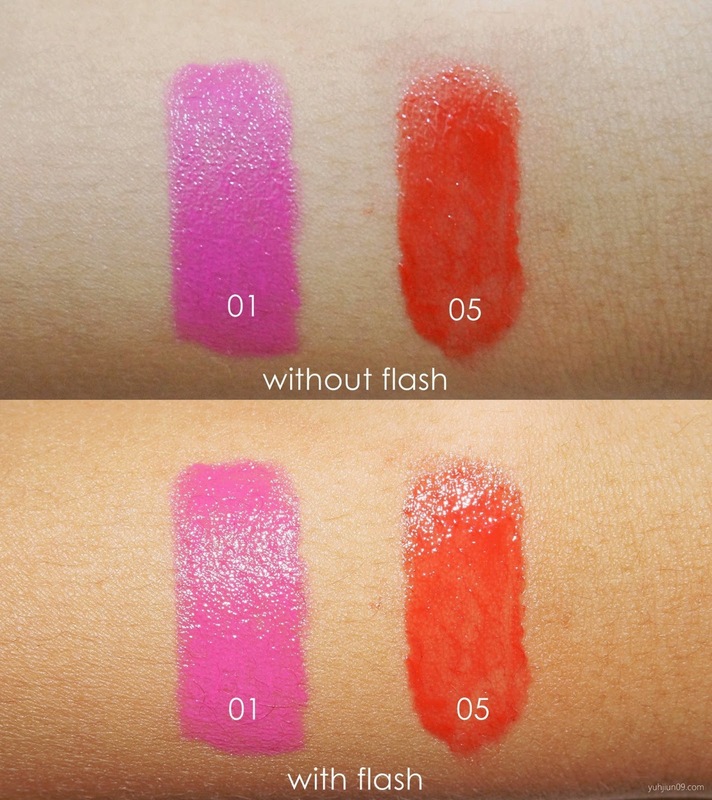 I'm never a lip person because I always think that lip colours are only for older or mature woman, but this Miss Hana Lip Balm Crayon has proved me wrong. 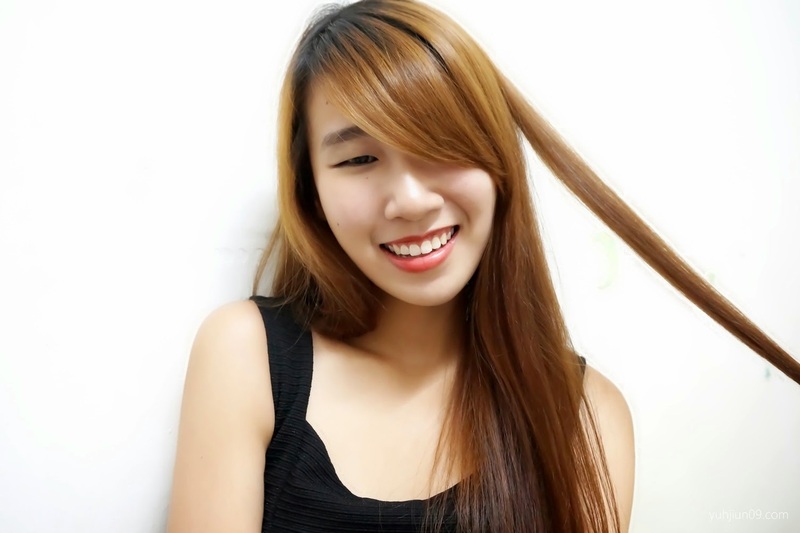 Miss Hana, a cosmetic brand which originated from Taiwan, has been highly raved by many beauty bloggers and youtubers especially their waterproof gel eyeliner. 8 out of 10 of my blogger friends have it in their make up pouch! 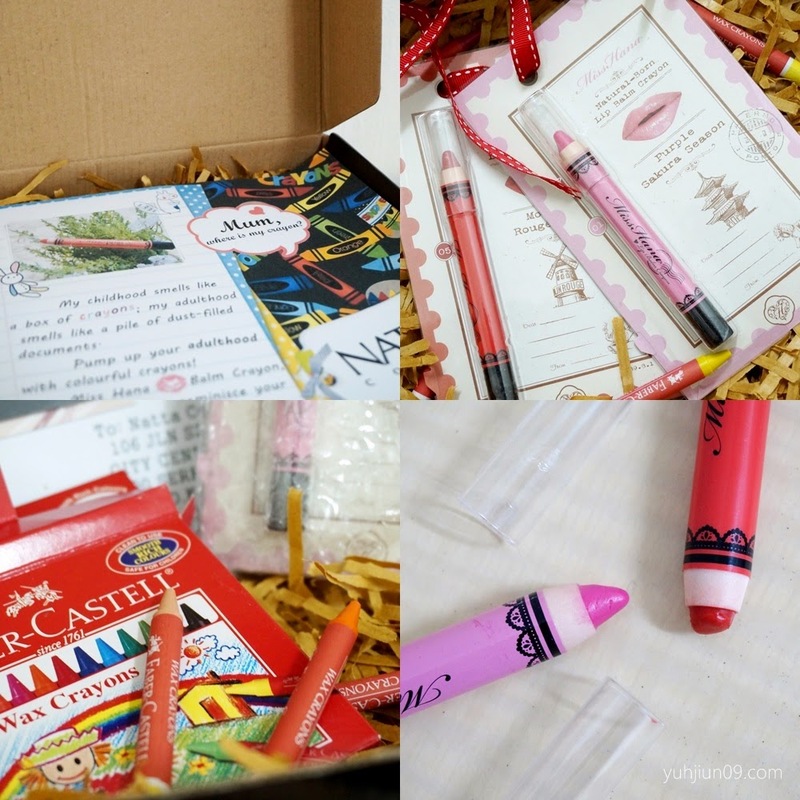 Therefore I'm really glad and looking forward to try out their lip balm crayon when I was chosen by Natta Cosme to review it. 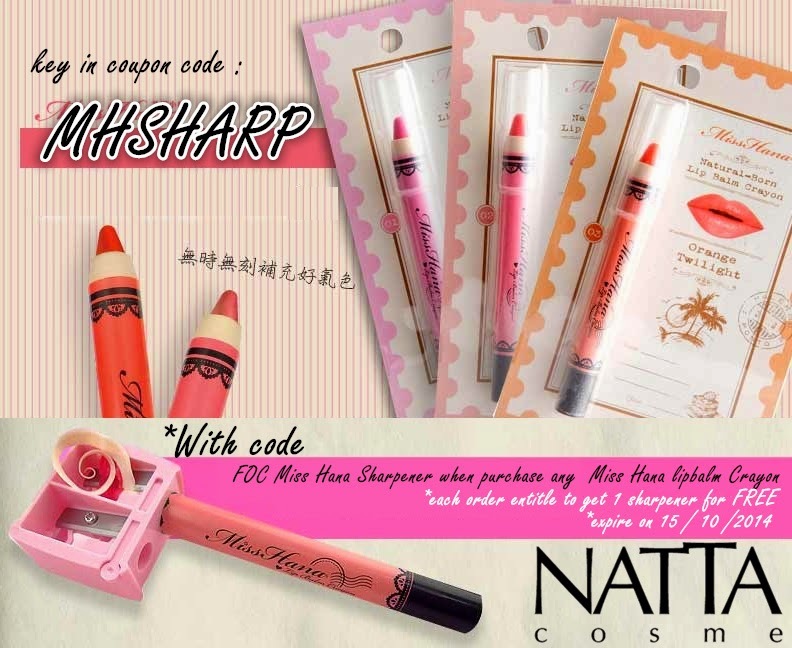 I always love Natta Cosme's packaging and those written messages from their team. Definitely a plus point for online shopping! 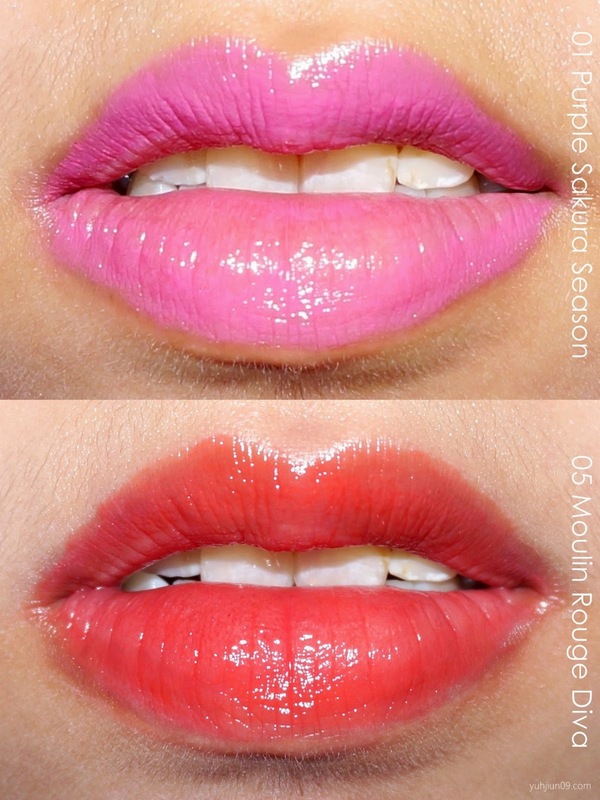 Miss Hana Lip Balm Crayon available in five shades and these two colours are the one I'm going to review today: 01 Purple Sakura Season and 05 Moulin Rouge Diva. Ingredients, directions and warnings are all clearly stated at the back of the packaging and the lip balm crayon itself. Swatches on my hand and you can see the colour is really pigmented. When I first receive the parcel, I was thinking that the hot pink colour doesn't suit me well but in the end it gives very healthy glow sheer colour, which is suitable for daily make up look too. The texture is very soft and smooth but it breaks easily especially when you pull out the cap. Silly me just broke it even before I get to use and take picture of it, which explains the blunt-tip in all my pictures. Miss Hana Lip Balm Crayon contains rose hip oil, aloe vera extract and vitamin E which specially suited for chapped and dry lips. It does smoothen my dry fine lines and gives me soft and supple lips upon applying the lip balm crayon. As for the fragrance, I personally love it very much where it smells similar as the old school fragrance beads. On the other hand, this lip balm crayon is not long lasting where you can wipe it off easily or the colour will gone after a meal. Besides, it's not retractable and you need to use a sharpener when the tip becomes blunt.